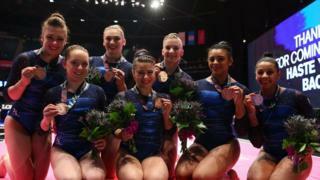 Great Britain women win their first ever world team final medal by claiming bronze at the World Championships in Glasgow. The Americans produced an error-free performance on the four apparatus of vault, uneven bars, beam and floor to score 181.338 points. China accumulated 176.164 points for silver, with Great Britain scoring 172.380.